There is not a lot that tells you more about somebody’s style of cooking or their methodologies than an invention test. So on day three we set the guys loose on whatever they can find in the kitchen (or beyond if they wanted it!). 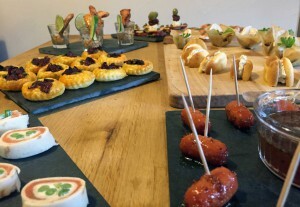 The one goal is that at the end of an hour and a half they are to have two canapés of their choice on the table, presentation only tethered by their imaginations. Now, the reason we do this with canapés rather than full meals is that this session uncovers everything about a person’s approach to the kitchen; their palate and understanding of flavours; their attention to detail; their presentation skills; their inventiveness; their problem solving skills (or crisis management dependent on how badly it goes! 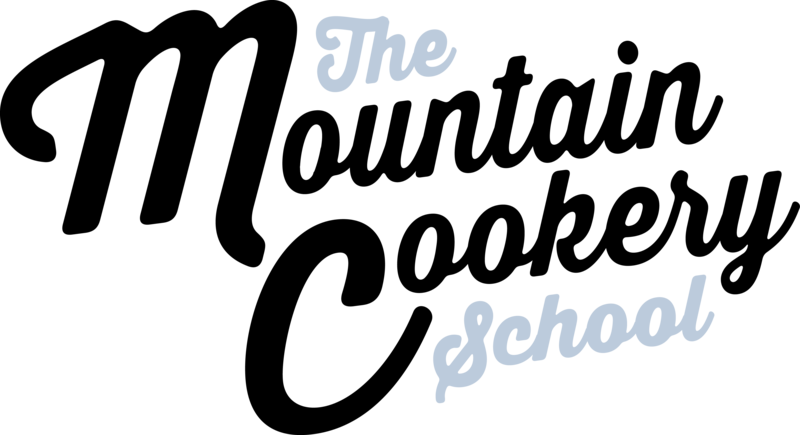 ); their ability to budget (using left-overs); their bravery…. And their unrestricted flair. 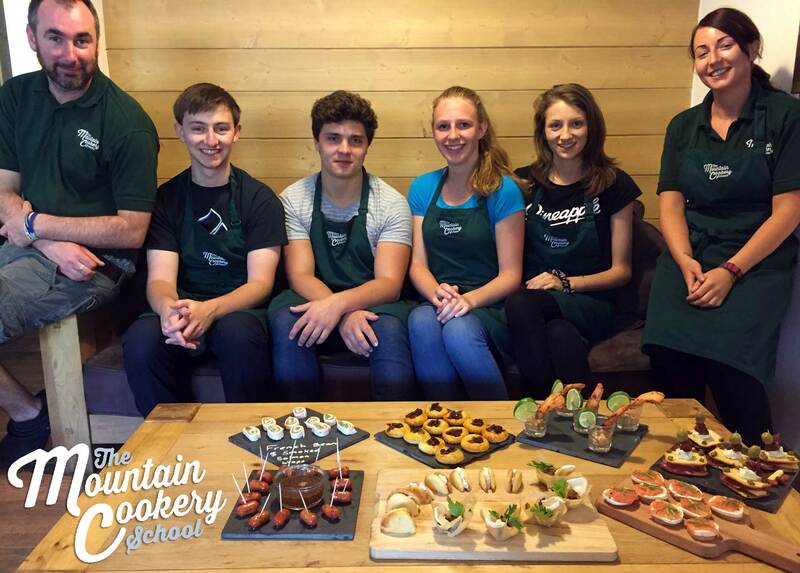 In the Mountain Cookery School there is no right or wrong on day three. From of all of the sessions we do, this one gives us the insight to better cater to an individual’s needs through the rest of the week’s course. Chalet hosting does require cooking skills, but we can train somebody to cook and clean- we can’t necessarily train the personality or the mind-set desired of someone to successfully host a chalet. Here, it doesn’t matter if things go disastrously wrong. Some things will. It’s how a person reacts to it and fixes it that matters. We almost hope that things go wrong so that we can see that side of each student. And our group this week (Ella, Charlotte, Kieran and Michael) are as different from each other in approach as can be. Kieran immediately had the iPad out, and was looking to go extravagant. Not afraid of any kind of failure and using the opportunity to discover, he set about with the mantra, ‘what’s the worst that can happen’? And he went big….. Stuffed savoury homemade choux buns and caramelised onion and goats cheese tartlets. Bravest man in Tignes, considering he’d never made pastry before, let alone choux! Michael in contrast adopted a far more shrewd approach, asking one of the tutors what his favourite canapé was, and going for that! Smart ploy! Mustard mini sausages with sticky honey and a second choice of smoked salmon with goats cheese crostini. Both of which are trusted flavour combinations, and comparatively simple to create, allowing him to concentrate on the presentation. 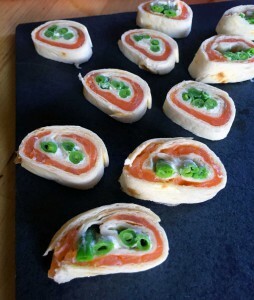 Charlotte felt in her comfort zone with salmon, green bean and goats cheese wraps having created similar before, but sought inspiration from a cook book for extra wow. Her second choice of Chorizo, sun-dried tomato and pesto puffs would need to show a deft of hand to look impressive. Immediately she looked assured and set out with a crystal-clear plan of how they would look and taste at the end. Charlotte’s planning was sublime, and every step was pre-mapped out in her mind. Ella went along a more inventive route, without any real external influence. Quite clearly imaginative in her ideas, and clearly understanding how her recipes would come together at the end in terms of taste…. With the presentation being left to natural evolution rather than planned. I like that. I like that she was flexible, yet had an eye for detail which cannot be taught. She was creative in her outlook and went for a chilli-chicken satay shot (obviously influenced by her recent travels to Thailand), with some Tarentaise-inspired crackers which she would arrange artfully before presenting. Four very different approaches to a training scenario made more difficult buy the man encircling with a camera and distracting chatter! They did brilliantly! Michael finished first with his smoked salmon and goats cheese crostini, and his honey and mustard mini sausages (I hope they make it to the final table without Jon nibbling them!). In true team spirit he then turned his attention to setting the table for maximum wow whilst the others finished off, churning out some great napkin folding as he went! Charlotte’s wraps were colourful and vibrant with every last planned detail being achieved. Such was her desire for detail that she annoyed herself by cutting one or two a little bit thicker than the others and not leaving it in the fridge long enough to hold firm throughout. 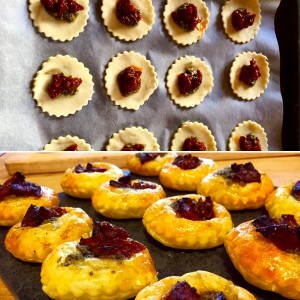 And Charlotte’s chorizo, sundried tomato and basil puffs were an absolute triumph. Her deftness and the self-control she showed against overload them, meant these were one of the stars of the show. Beautifully finished, amazing-smelling and incredibly tasty canapés. Ella’s vision for shots of satay chicken also worked well, and visually at least was probably the stand out canapé (although secretly, this dish was so far up my street, I had to be very strict with myself to refrain from licking the bowl/shot glass!). 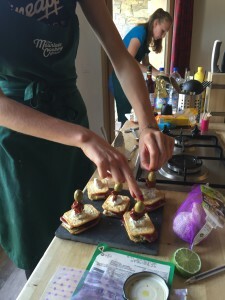 Ella’s second canapé, the cheeseboard-charcuterie Tarentaise-inspired cracker sandwiches really was an invention in design! Although it’s not something we could present in the chalets, the flavours will certainly be used together, showing a good knowledge of local flavours and style. Personally I think if she had used toasted bread (crostini) or blinis then it would have been a bigger hit….. Ella’s attention to detail and flair was clear to see, and it’s clear she’s going to excel at adding wow to the dishes she cooks. And for bold and brave Kieran. This guy set out to challenge himself, and push the limits. 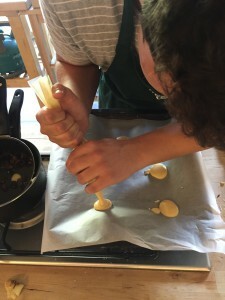 Having never made a choux before, let alone at altitude, he had given himself a lot to do. And why not? It’s pretty much what I would have done and was full of admiration and respect for him. So did they work? No. But who cares? That’s what this session is about! But what happened next pretty much set out his attitude, and referring back to the statement at the start… it’s how you rescue it that matters. The choux didn’t rise as much as it should, but without even batting an eyelid, he took a taste, nodded, stated that they still tasted awesome, sliced them in half like a macaroon, stuffed them with his stuffing anyway and served them looking like they were always meant to be served like that. His tartlets, despite clearly playing second fiddle to the failed choux, were a joy. I think Kieran found these easy and just something which naturally rolled off the hands. Very impressive. So all-in-all a really successful and enjoyable session which I feel privileged to have witnessed. Four great young people looking to start out on ski seasons. They are being interviewed on the Tuesday following the Saturday I spent there, for a chalet host role in the mountains for Skiworld, and if today is anything to go by, I have no doubt they will both pass the course and the interview with flying colours. I look forward to catching up with them on our training course in November. Big thanks to Jon and Sarah for welcoming me to the session, and for putting so much effort in to training yet another amazing group of young people who I’m sure will go on to maximise Skiworld guest’s experiences in the coming winter and beyond.